Pretreat the tap water with chlorine, then dechlorinate it before pouring it into our system or making-up your sea salt mix. This method of treating tap water may be good for killing off potential bacteria that may be present, but it does not remove contributory problem chemical elements such as phosphates, nitrates and silicates that give rise to algae blooms, or heavy metals such as copper or iron that are detrimental to reef animals. Purchase a basic tap water filter. These types of filters may not be ideal, but they do somewhat improve water quality by removing chlorine and some contaminates, and are better than using nothing. We use a Teledyne WaterPik Filter on our kitchen tap for drinking, as well as adding top-off water to our 55 gallon aquarium. By prefilter the water through carbon filtration it not only removes chlorine from water, but helps to eliminate phenols, odors, and other contributory problem elements as well. Carbon filtration can be accomplished by purchasing a compact hang-on-tank type canister filter that provides a media chamber where carbon or other filtering material can added, or by making your own carbon filter like this simple PVC Water Tap Filter designed by Don Carner. 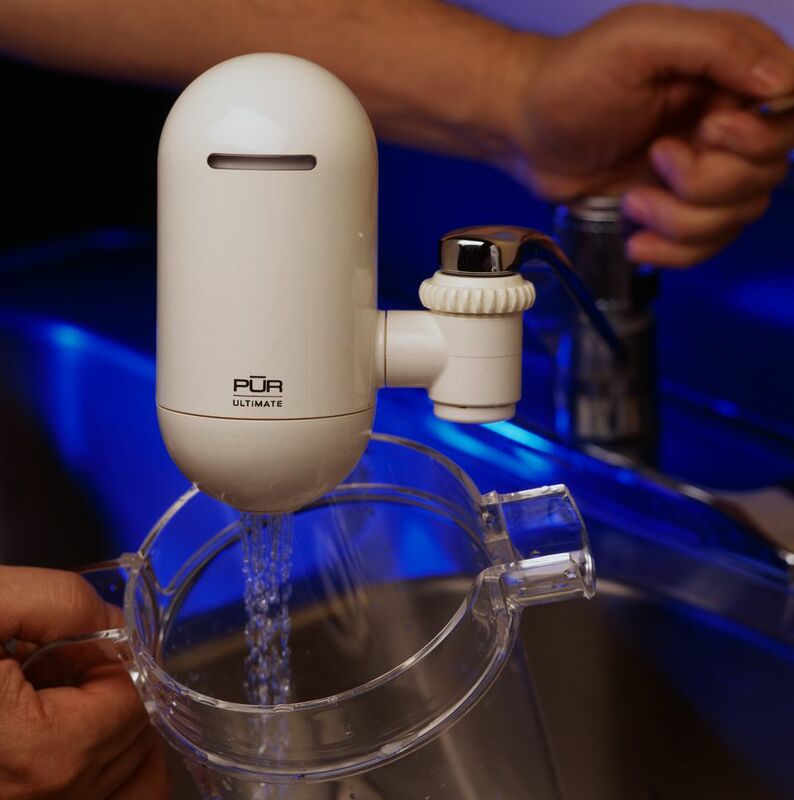 Purchase an RO, DI, or better yet a combination RO/DI water filter unit. The initial investment may be costly for one of these units, but they pay for themselves rather quickly, and are by far the most effective water purifying filters on the market. The following fresh water source alternatives should be considered in place of using tap water to make-up sea salt mixes or add as top-off water to a saltwater system. The reason being, that even after filtering or purifying tap water, it can still potentially contribute to problems that often arise in aquariums. Check with local fish stores in your area to see if they sell RO/DI (Reverse Osmosis/Deionization) filter unit processed water. Check with any public aquariums or commerical water companies in your area to see if they sell filtered fresh water. Even better yet, rather than having to make up sea salt mixes at all, see if they sell filtered "natural" sea water like the Seattle Aquarium in Washington State or the Catalina Water Company in Los Angeles does. Find out if there are any public RO/DI water dispensers set up in your area. Kind of like a vending machine, you put your money in, and it pumps filtered water out. Believe it or not, one of these units was set up here on the island of Moloka'i in 2002, right in the town of Kaunakakai where we live! Buy bottled water from a water bottling company that uses commercial RO/DI units. You can also use bottled distilled water, but one concern with this type of water is that the bottler may use copper tubing during the distilling process. Not all distillers use copper tubing, so if this is a concern, test the water prior to use for any copper levels. You can always contact the manufacturer and inquire about their processing methods.